Last weekend I did two talks at SQL Saturday #89: one on StudioShell that seemed well-received, and another titled “Stupid PowerShell Tricks” that was basically an hour of laughter and learning. Many thanks to the volunteers and sponsors, and to everyone who attended for all of their positive energy. 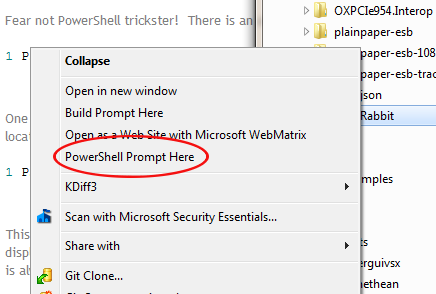 What is a Stupid PowerShell Trick? As I defined it in the session, a Stupid PowerShell Trick is any PowerShell element that has the potential to make your life or work easier. These are not full solutions to exact problems, but rather small techniques you can employ in various situations. What was that you just did there? Most of the time this question was shouted in response to some shortcut I have built-in to my session instead of the main point of the presentation. Turns out, I have more than enough of these little things to create a talk around them! 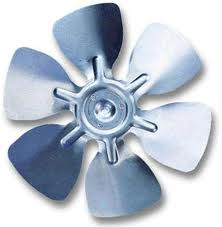 You may never need it, but if you ever need to stop a fan with your tongue, its empowering to know that you can. Yeah, like I said, the tricks are stupid. But this saves me countless keystrokes a day and I move from client to client, project to project. This next trick is a PowerShell gimmie – it’s built right in to the default session configuration. The example above will open each file in the appropriate application. No fuss no muss. This takes advantage of the fact that the default action for a folder in Windows is to display it in explorer. The dot in the command represents the “current path location,” which is always a folder. This one plays compliment to the previous trick. 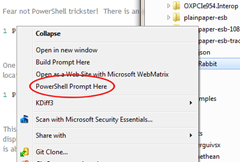 Sometimes I need a PowerShell prompt open in the folder I’m looking at in explorer. For that I use the PowerShell Here registry hack from Scott Hanselman’s blog. 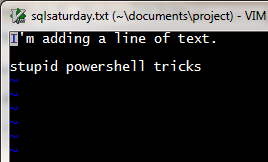 This hack adds a PowerShell Prompt Here entry into the context menu for file folders. Clicking the menu item will, as you’d expect, crack open a new PowerShell console that is pre-navigated to the correct folder. Super-handy to have when you need it. VIM is a super-handy text editor that can run inside of your PowerShell console session. Wait, let’s go over that again: it’s a text editor that runs inside of your PowerShell console. VIM’s been around for … well, forever basically, in one form or another. It’s a cross-platform port of the Unix VI tool, and it works the same in Windows, Linux, MacOS, you name it. Mind you, I’m not at the point where VIM is my editor of choice – but when I need to make a quick edit to a file while I’m working in the shell it’s sooOOOoooo much faster to jump in and out of VIM than it is to bounce from the shell to notepad or PowerGUI and back to the console again. My hands stay on the keyboard, which reduces the chance of my RSI coming back. Now, VIM’s no picnic, but the juice is well worth the squeeze. I highly recommend bookmarking the VIM docs, printing out some cheat sheets and jumping in. These last three tricks all have to do with pushing data someplace. This example copies the list of files and folders in the current directory to the clipboard. You can paste the list in any program – notepad, word, email, etc. Or… oh whatever, you get the point. There is a handy built-in PowerShell command called out-gridview. PowerShell n00bs tend to really like this command because it produces a UI – specifically a nice WPF grid displaying whatever data you pipe it. Rather than show you what this does, I’d rather you play with it for yourself – take the examples from Trick #5 and replace “clip” with “out-gridview” and see what happens. This one is really great when you want some data to hang around while you execute other commands. The console is awesome, but the output doesn’t stick around too long. And finally, the piece de resistance, the coup de gras, the penultimate of the first round of Stupid PowerShell Tricks – I present to you in all its glory … out-voice. A few months back @shaylevy posted a little gem that demonstrated the use of the Microsoft Speech API from PowerShell. I’ve already blogged a bit about it, and how using PowerShell to explore new APIs is both fun and rewarding. This trick is basically an extension of that tweet from Shay. One day I was working on a rather convoluted build while trying to help my daughter with some math facts. The build took a long time to run - I wanted to give my little girl the full attention she deserved, but I also needed to get this build out. So I rigged up a way for the computer to tell me when the build was completed. This way, I can ignore my computer the way my daughter deserves, and still know exactly when the build has completed. The $voice variable is set to a Speech API COM object in line 1. Line 4 defines a function named invoke-speech; the param statement on line 6 and the process block on lines 8-11 allow this function to receive pipeline input. The magic happens on line 10, where the input passed to the function is sent to the speech API for processing. Line 14 aliases the command out-voice to the new function. Fun? Oh yeah. I highly anticipate you blogging on your own Stupid PowerShell Tricks; send me a link through the contact form or add a comment with a link to your blog! SOOOOoooooOOOO… I’ve been a bit incognito lately and I thought I’d take a moment to summarize what’s been happening in the last three months,and give everyone a head’s up for the rest of the year. May was consumed largely by two things. The first was volunteer work at my kids’ school during EOG testing. I was basically there for 5 hours every day for three weeks, so the teachers could administer 4 exams for each of their 24 students one-on-one as mandated by the school board. I couldn’t stop the testing, but I did what I could to ease the pain on the school, teachers, and kids. The second thing was prepping talks for the summer conferences – CodeStock, MADExpo, and DEVlink – and various code camps in the Carolinas and Georgia. I headed out to CodeStock at the end of May, where I spoke about StudioShell; it was another fantastic conference experience, the highlight for me was getting to kick Charles Petzold out of the room so I could give my talk immediately after his. I mean, freaking Charles Petzold. July was comprised of work, work, work … and a vacation in the east Texas desert, during which I managed to line up a substantial contract that consumed most of August … except of course for DEVlink. This was my first DEVlink experience and it was a good one (despite the lack of wireless and cell coverage and no, I didn’t stay at the Choo-Choo either). I definitely made more connections – social and professional – at DEVlink than at any other conference thus far. I did another StudioShell session there. Jaws hit the floor, it was well-received. I also attended PowerShell sessions by other speakers – Sarah Dutkiewicz and Joe Webb – I love seeing how different people approach teaching this technology to others. With the summer over and school back in session, my speaking focus is shifting back to user groups and events. This Thursday, September 15, I’ll be speaking at the WNC .NET User Group about PowerShell for Developers. I’ve expanded this talk to include PSake, Pester, and StudioShell; I look forward to the feedback on the new topics. Then on Saturday, September 17th, it’s SQL Saturday #89 in Atlanta. This will be my first SQL Saturday ever, and I’m so glad to be bringing the PowerShell and development love to the database community. I have two sessions – the first is using StudioShell to automate Denali, and the second is a brand-spankin’ new talk titled “Stupid PowerShell Tricks”. I got the idea from going over some of my other talks and realizing that the most frequent question I get asked is “What was that you just did there?” I also find myself asking this question quite a bit of others – especially when I’m around admins or DBAs. Since there is obviously much we can learn from each other, I decided to make a session out of it. I’ll show you my stupid tricks and you show me yours, and we’ll all walk away with new ways to get stuff done! Later this month – September 22nd to be exact - I’m heading to the Triad Developer’s Group to spread more PowerShell love to Carolina software developers. In October it looks like I’ll be a guest on Talk TechNet (details to follow). In November I’m heading up to the Raleigh .NET User Group to demo and discuss StudioShell.